If you planted squash in your garden this spring you probably have an abundance of zucchini right about now or if you're like me and thought about planting a garden, never got around to it, but got lucky enough to have your husband's coworker share her abundance of zucchini, go ahead and make this zucchini bread recipe. 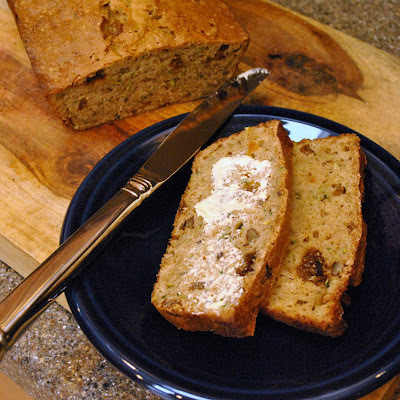 I've sung the praises of quick breads before (Jalapeno Cheddar Bread, Pecan Streusel Topped Banana Bread, or Lemon Poppy Seed Bread) but they are so easy! You can literally have this in the oven in 15 minutes. Can't do that if yeast is involved! This makes a great treat for a mid afternoon snack, a quick breakfast, or even a light dessert served plain or with a dab of butter. It is slightly less of an indulgent with the oil replaced with unsweetened applesauce. You could also use whole wheat flour for half of the all purpose flour to make it even healthier but I didn't have any on hand. This recipe will make two loaves and they freeze very well so go ahead and make both even if you won't go through them in a few days. Or give one to the neighbors, or in my case, your zucchini supplier. Preheat oven to 350 degrees. Spray two 8" loaf pans with baking spray. In a large mixing bowl combine flour, cinnamon, soda, baking powder, salt, and nutmeg. Stir to combine. In a second mixing bowl, whisk eggs until lightly beaten, add sugar, zucchini, and applesauce. Make a well in the center of the flour mixture and mix in wet ingredients all at once. Stir just until moistened. Add pecans and raisins to the mixture and fold in. Divide batter evenly between pans and bake for 50-55 minutes or until a wooden skewer inserted in the center comes out clean. Cool in pan for about 15 minutes, run a knife around the edges to loosen and remove from pan. Cool completely on a wire rack. Wrap tightly in plastic wrap to store or freeze. I've been wanting to make Zucchini Bread, I'll be making this weekend!